Welcome to Homestead Senior High School! Homestead's goal is to achieve excellence by focusing on the "whole child". To that end, we have reformed our school into small learning communities that will provide students with available career choices giving consideration to their future plans, goals, and aspirations. Within these academies, students will explore courses related to their specific interests. In addition, the programs provide students with opportunities to participate in our Advanced Academic programs through Advanced Placement and Honors courses. 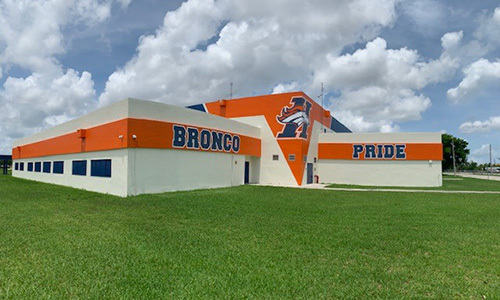 For further information about our curriculum, subject selection, registration procedures, graduation requirements, and/or about the school in general, please visit contact our school at (305) 245-7000. Again, welcome to Bronco Country! We look forward to assisting you and your child in making important decisions regarding their educational and career aspirations.